Travelers insist more than ever on mobility, but travel at all costs is no longer an option. Now it seems the only way forward is with energy-saving transportation technologies and integrated, intelligently networked all-in-one solutions. Measurable success in protecting the climate and achieving sustainability goals are being made - but, we are a long way from the finish line. The objective of this conference was to reflect on the challenges and potential for encouraging preferred driving behaviors in New York State. 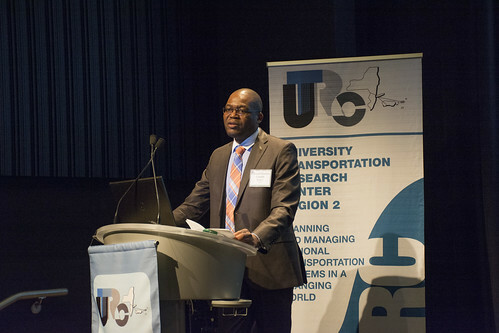 The conference featured speakers who discussed topics such as cutting-edge technologies, commercial freight applications, communication and marketing, driver training, behavioral factors and incentives, as well as policy implications of implementing an eco-driving program in New York. Jamyn Edis, Adjunct Professor at NYU & CEO /Co-founder @ Dash: "DASH Smart Driving App"